The title of the novel The Man Who Loved Books Too Much by Allison Hoover Bartlett made me want to read it. When I started reading the novel, I hadn't read any reviews or synopses and had no idea what to expect. 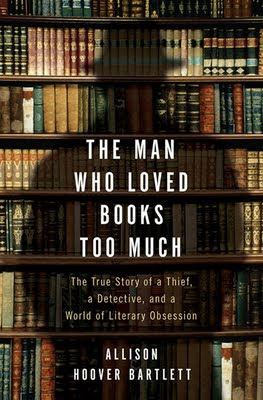 It is the story of a notorious book thief and a clever rare-book dealer who tracks him down. It provides a glimpse into the quite magical world of rare book collectors. There is not much to say about the writing style. I found it a bit pompous, too literary; but it's one of the things you learn to overlook when only the plot/ideas get you so involved in the book. The author's opinion about the fact that many collectors don't actually read the books they collect was first surprising, then convincing. It is the love for the physical beauty of books that drives people to collect them. The yellowed pages, the delicate spine and that old smell, I'd be lying if I said never I loved books for all of that. "Much of the fondness avid readers, and certainly collectors, have for their books is related to the books’ physical bodies. As much as they are vessels for stories (and poetry, reference information, etc. ), books are historical artifacts and repositories for memories—we like to recall who gave books to us, where we were when we read them, how old we were, and so on." Don't you completely agree? There are so many books that I do judge by their covers. So many books I don't like but can't manage to give away, because they have that special meaning, beauty attached to them. I have fond memories to associate with every book I owned as a kid; serious discussions along with bookish games and crazy fan-girl obsessions. I still remember reading the first few pages of The Diary of a Young Girl in my school library. It was the first hardcover novel I read, and that edition carried pictures of the girl and her family and a map of the place she lived in; along with a few copies of the original diary entries scribbled in her own handwriting. The fact that I didn't like the book as much as I thought, doesn't remove the memory. The excitement it caused me to think that the book was actually someone's life, gave me sort of a new perspective on reading. Like the author says, even physical artifacts (like books or paintings) carry memory and meaning. I'd recommend this book to anyone who loves reading or loves to hold a book in their hands or loves, much like the author, to spend time in libraries, surrounded by books. It is one of the best books about books. "Sitting in any library, surrounded by high shelves of books, I sense the profoundly rich history of scholarship as something real, and it’s both humbling and inspiring. This manifestation of reality is true of other artifacts as well. We can read about the Holocaust or where Emily Dickinson wrote her “letter to the world” or where Jim Morrison is buried. We can view online photos of all these places. Still, each year, thousands of people visit Auschwitz, The Homestead, and Père Lachaise. I suppose our desire to be near books rises from a similar impulse; they root us in something larger than ourselves, something real." What an intriguing title! And as a lover of physical books (though I DO try to read everything I collect!) it sounds like a wonderful read. Oh lovely review. I'm definitely someone who loves a book in my hand though I'm not sure I overlook writing that is too pompous. marveloustales - Oh even I do want to read all the books I own, but I also do like the physical appearance of many books that I didn't like. Alexis - Only a bit pompous, and the plot is very involving; you might make an exception in this case!